Two kids plant mysterious seeds (all that?s pictured on the envelope is a blue top hat), and up grows a remarkable flowering vine, out of which emerges an even more remarkable big white bear. On his head is the top hat?a hat that allows him to work all kinds of magic that day. He pulls monkey after monkey from the hat, blows bubbles in amazing shapes, and transforms flowers into spectacular floating sea creatures. The two kids are wide-eyed with wonder, and you will be too. This is a dazzling debut?a vibrant, welcoming, strikingly original picture book. 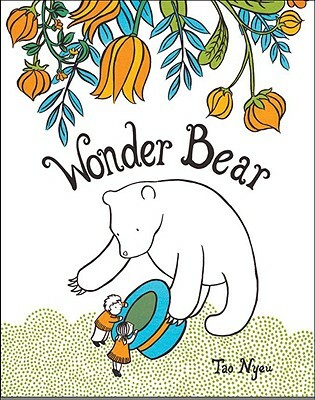 Wonder Bear was Tao Nyeu’s thesis project as a second-year graduate student at the School of Visual Arts in New York. She now lives in Los Angeles, California.